The gaming industry has really levelled up. In 2017, the UK gaming market grew to record heights of £5.11billion; an increase of 12.4 per cent. Globally, the industry is expected to grow from £110billion in 2018 to over £141billion by the end of 2021. But you don’t have to look to the stats to see the growth of gaming. Simply listen to your kids at the school gates or your colleagues in the workplace, and you’ll know that some games (the ubiquitous Fortnite, for one) are capturing countless imaginations, both young and old, including people who might not have traditionally described themselves as ‘gamers’. With the gaming industry in such fine fettle, retailers now have the perfect opportunity to create an immersive in-store experience to drive user engagement and interaction in an offline environment. The gargantuan growth of the gaming industry and its entry into the mainstream undoubtedly presents a huge opportunity for retailers. Given the scale of the opportunity, it’s clear straight off the bat that regular point of sale just isn’t going to cut it. But a better in-store retail experience that capitalises on immersive technologies is not just a ‘nice to have’ here – it’s critical for tackling the monopoly of online retail and making the most of the opportunity in UK gaming, otherwise it could be game over for stores. Here, as a leading digital solutions provider, UXG explains why. It’s no secret that the high street is struggling, and all types of retailer must come up with a compelling offering to beat the convenience of online shopping. But this is particularly true in relation to gaming thanks to two main points: the visual nature of games, and the expectations of gamers, an incredibly influential set of consumers. The solution is simple: gaming retailers must differentiate themselves by offering a hands-on experience that online can’t. Immersive experiences, such as virtual reality (VR) or live dual gaming, offer something different that will make a retail visit an experience in and of itself. In this omni-channel world, the customer might still convert to a sale online, but a memorable and unique in-store retail experience will be a critical part of that decision-making process, rendering bricks and mortar more relevant than ever. The medium of games is inherently visual. Teams made up of hundreds of world-class artists spend years developing the environments, characters and assets within a game, and as hardware capability improves, so does the quality and realism of the games themselves. With the end product being so visual, it stands to reason that you need the display technology to show it at its true potential. After all, a 4K game on a 1080p screen is only as good as the screen it is shown on. Look to gaming conferences such as E3 and EGX, where games developers and publishers communicate directly to consumers – how do they showcase their games? They don’t present lengthy powerpoints or talk through gameplay; they show it, in as impactful a format as possible. This is the most effective selling tool in the retail environment too. A particularly impressive way to show is through VR, an immersive, computer-generated experience, usually created via a headset, using audio, visual and sometimes haptic sensory feedback. VR is an essential part of the wider retailing industry’s future, but it particularly lends itself to gaming, truly immersing players into the game world and story. As VR technology becomes cheaper and more accessible, it becomes more of a no-brainer to incorporate this into a gaming retail experience. The growth of the gaming community, now said to stand at around 2 billion, has coincided with the growth of the internet. Gamers have become one of the most active groups online; two of the top-five YouTube channels with the most subscribers are gaming-related. Video game live streaming platform, Twitch, reported that there has been 44 billion minutes watched per month in 2018, and there are myriad forums and chatrooms dedicated to gaming chat. With this constant exchange of news and information, the expectations of the community are consistently growing, and the market is becoming notoriously opinionated, hard to impress and vocal when displeased online. These growing expectations demand that games be showcased in the best, most compelling way possible in order to appeal to the market, and also in a way that offers something unique that they can’t find online or from within the community. Live dual gaming is a really effective way to achieve this. Two or more gamers can go head-to-head, with both screens broadcast onto a larger communal screen in-store. Here at UXG, we worked on a project that did just that, creating an interactive gaming zone which encouraged customers to get hands-on in a way they couldn’t by browsing online. The result was a unique experience, and an attraction that enticed customers into store. This format works because you’re capitalising on the fact that the gaming community is now profoundly sociable. 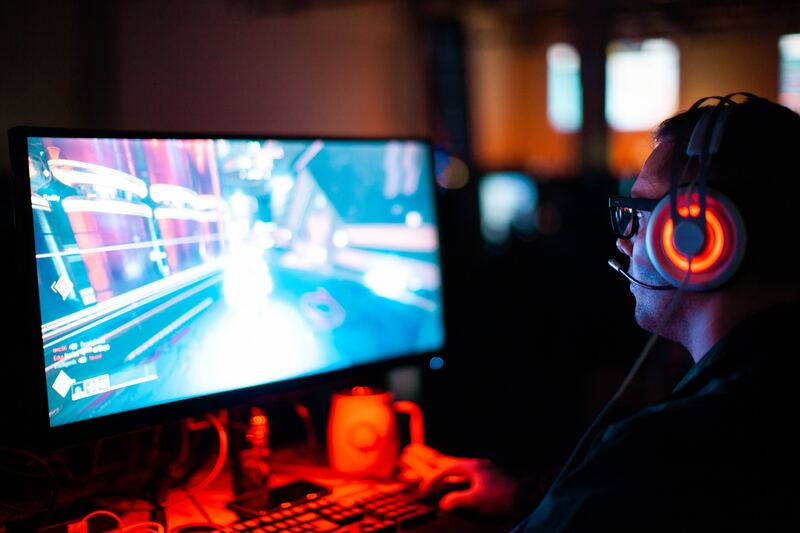 With audiochat and online messaging becoming a more integral part of the experience when actually playing games, gaming is no longer a solitary endeavour. In harnessing this sociability and bringing it in store, you make the retail environment an extension of the community, and offer a unique and memorable in-store experience. What’s more, not only is it an engaging way for the players to experience the gaming technology you’re selling, but it’s also inclusive for others in the same retail environment, making the live gameplay something of a spectator sport. And you only have to look at the rise of large scale gaming events and eSports to acknowledge the popularity within the community. More ambitious still, scaling up this live dual gaming format, and having it not only as an in-store fixture, but as an exclusive, time-bound event, could be a way to significantly increase footfall. With the gaming industry in such fine fettle, retailers now have the perfect opportunity to create an immersive in-store experience to drive user engagement and interaction in an offline environment. This will tackle the issue of reduced in-store footfall at the hands of online shopping, and will also allow retailers to innovate and differentiate themselves from the competition. To learn more about UXG’s work within the gaming sector, view our project page.